Off-road tires are radial tires that have thick, deep tread. The exposed edges of the tread dig into the soft ground to give more traction when negotiating a dirt surface. The off-road tires provide maximum grip on loose surfaces but less traction on a paved surface because of the small contact patch the tires afford. Some off-road tires are designed to have lower inflation pressure for better grip on difficult terrain. The low pressure allows the tire to conform to the terrain. 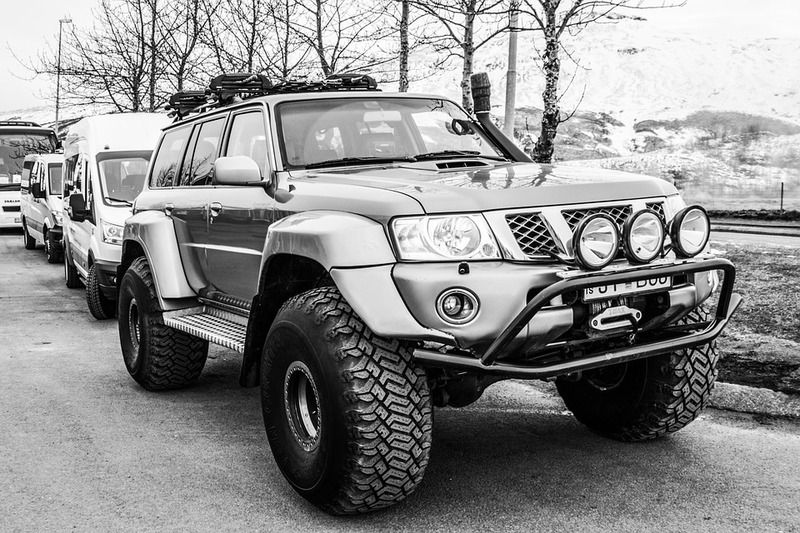 Many off-roaders will advise you to get bigger tires. However, there are many technical aspects involved in increasing the size of your tires. You may need to lift the vehicle in order to accommodate the bigger tires. Lifting your car or truck could change the geometry of the suspension components, which could put extra stress on other car parts and create internal weaknesses. The last thing you want is for your vehicle to fail while you are off-roading on a remote trail and can’t get help. If you upsize your tires, you may have to replace the driveshafts or install gears with a shorter ratio. If you install heavier tires, you will need to upgrade your axle and change to longer shocks, which will also require extending the brake lines. After making all these changes, you will need to recalibrate your speedometer. Installing off-road tires that are larger than the vehicle’s original stock tires will have a direct bearing on the vehicle’s performance. Your vehicle was manufactured with the optimal axle gear ratio that is designed to work with the engine. The stock tires provide a good balance between the vehicle acceleration and its fuel economy. Installing taller tires on the same axle ratios will reduce the gear ratio, making the engine operate below its power band. This results in the performance and fuel economy suffering in the process. There are options for correcting the gear ratio, however, so that your car can run properly with larger tires. You can closely match the RPM of the vehicle with stock gears and tires with the appropriate RPM. You will have to decide if the benefits of having bigger tires will outweigh the associated challenges. Installing off-road tires is not as simple as going to the tire shop and asking for them. You will have to consider many factors, so consult the professionals to help you make the best choice. Start by going to your trusted tire store and asking the experts. Travelling on a high way will give you a smooth ride. But, going off road can be both adventurous and dangerous especially if your vehicle is not suited for it. If you have plans on having a joy ride somewhere far and rough, check your tires and see if it is capable of handling the rough roads. This infographic should tell you more.